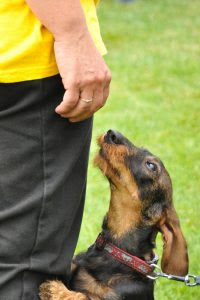 Our sister company Paws Positive Dog Training is the kind and gentle way to train dogs. We are fetching a new and exciting way of training to this area where we use games to build concepts which shape the personality of the dog, so we end up with solving real life struggles and turning them into strengths, rather than just teaching sit, down,stay etc. Amanda Jane Is a Pro dog certified dog trainer coached by a veterinary behaviourist Tom Mitchell and a champion agility trainer Lauren Langman. She is a ADTB Qualified and approved instructor and behaviourist , a member of Sarah Whiteheads inner circle and a full member of Dr Ian Dunbar’s all access pass group. Although Amanda trains all aspects of dog training she specialises in children and dogs and puppies from 8 weeks of age. The main reason for dogs being taken to shelters or even worse euthanized is bad behaviour but many of the reported problems are normal behaviours for dog’s especially young ones. Many dog owners don’t know or don’t remember what is normal for a puppy. The problem isn’t always with the dog it’s with the owner’s expectations. The most commonly reported problems were house breaking problems, hyperactivity, barking, biting, chewing when the owner was away and fearfulness. Except for biting the behaviors should be expected from dogs but even with biting some owners confuse biting with mouthing. Amanda wanted to help these dogs so embarked on a training career to help stop at least some of these dogs been taken to shelters. A trained dog is a happy dog and a trained dog means a happy owner. These sessions take place in your own home and are approximately 1.5 hours long. For the first few weeks of life puppies learn very quickly good things as well as bad. Early socialisation is extremely important factor to ensure you have a well-adjusted adult dog. 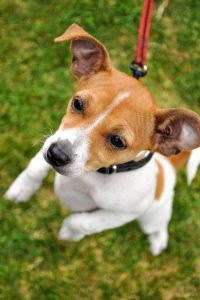 The socialisation window closes at about 16-20 weeks of age depending on the breed of the dog A puppy need to learn to adapt and get use to adults, children other dogs and cats as well as everyday noises from traffic, parks, town centres and household appliances. A puppy socialisation session is for the puppies and their owners to socialise with other puppies and people while aiming to keep the puppies calm so they don’t learn to become over stimulated by them. Part of the lesson will be off leash with interrupters of training at regular intervals. They will learn how to play calmly whilst learning from their own species. Some behavioural problems can be caused by an illness or injury so we would ask you to take your dog for a vet check before we start to work with you to rule anything medical out. We will come to your home as that where the problems arise and the initial consultation will be 2-2.5 hours, some problems can be discussed in just the consultation but some may need 1 or 2 further 1-1.5 hour sessions. We also include a detailed training plan to keep you on track with your training. And you have unlimited email access. Dogs can develop a range of behavioural problems such as destructiveness, separation anxiety, fearfulness, inappropriate toileting, fear of cars, excessive barking, possessiveness and phobias. We can work with you to identify the root cause of the problem and using kind scientific methods draw up a plan to eradicate the undesirable behaviour. All these plans and packages are tailored to yourself and your dog so please contact us to speak further. Are you worried your dog will bite your child? Are you expecting a new baby and are concerned how your dog will react? If the answer is yes then this one to one session in your own home from Paws Positive Dog Training is for you. We are here to help dogs and kids be comfortable together. How beautiful is it to watch children and dogs playing together in harmony? Watching a child and dog’s friendship grow. Some dogs naturally love children but a lot find them annoying or scary. Don’t leave it to chance give your dogs and kids the best chance by taking steps to create a dog that loves your kids and also learning your children to respect and understand your dog. We can work with you and your child to achieve this. This is a full day DOG FREE seminar where we learn you to train your dogs and educate you regarding canine behaviour. This seminar is open to new adoptees, seasoned pet owners and anyone looking to learn a little more about how to communicate with their dog. This workshop covers the basics of how dogs learn and how you can make the most of positive training. this day long workshop shows you how to make yourself more interesting to your dog to make them want to be with you wether you’re at home, in the garden and at the park, beach or woods. the seminar is delivered Using positive and easy to understand language. This seminar is perfect for new puppy owners and contains simple games that any puppy can learn. These seminars will be organised and dates and venues released soon. Please register an interest by contacting us as there will be limited paces available. Lunch and light refreshments will be included throughout the day. We are hoping to start fun group classes very soon. Contact us to arrange any of our packages. © Paws 4 a Break 2018. All rights reserved.